Watani has launched an initiative to establish a compensation fund for the victims of the Islamist terrorist attacks that targeted Christians across Egypt on 14 August 2013. This initiative is based on meticulous efforts to record and document the numerous attacks and casualties which we here display according to their geographical location. – Kirollos Girgis Bebawy, injured, gunshot in the right arm causing a comminuted bone fracture necessitating internal fixation using plates in addition to nerve laceration necessitating surgery. – John Lewis (handicapped), injured, choked by smoke in addition to being dragged on the ground and thrown out of the church. – Complete burning of “Santa Claus” shops consisting of 5 stories. – Seizing an 8-storey building in Naim Street owned by Ashraf Zarif Soliman. 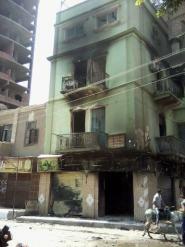 – Looting of a house in El Salam Street owned by Soliman Zarif Soliman in addition to robbing the gold jewelry of his mother. – Looting and burning of “Gunood Al-Massih” orphanage and adjoining building, warehouse and exhibition stall. – Burning of a Mercedes dump truck 1996 model, capacity of 30 cubic meters owned by Raed Rafik Botros. – Burning of a Scania dump truck 114, 2004 model, capacity of 30 cubic meters owned by Rageh Rafik Botros. – Burning of a motorcycle owned by Milad Malak Tawadros in addition to robbery of his wife’s gold jewelry. – Looting and destruction of “Al- Mahaba Ceramic” shop owned by Raafat Seddik Hanna in addition to burning two cars and stealing two others belonging to the shop. – Looting of “Al-Sadaqa” clothes store and a warehouse owned by Widow Nabila Moussa who provides for five daughters in addition to stoning of their house. – Burning of a Fiat 131 car owned by Father Misak Moawad of Saint Demiana’s which was also set aflame. – Looting and destruction of four houses owned by the church of the Holy Virgin used by the workers at the church.